Copper Mountain Real Estate offers a myriad of options for owning a ski property, including Copper Mountain ski homes, condos, townhomes, and duplexes – from an older more affordable condo near the slopes to luxury ski in/ski out homes. The East Village of Copper Mountain includes a mix of older and newer condo complexes that are ski in/ski out or walk to the slopes along with homes on The Copper Creek Golf Course. 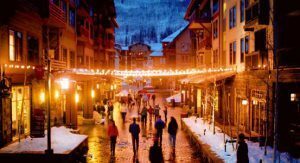 The majority of ownership options are found in the Center Village, comprised of Copper Mountain condos that are ski in/ski out or within a short walk through the many shops and restaurants in the Village to the lifts. The newest ski properties in Copper Mountain Real Estate can be found on the far West End of Copper Mountain in Union Creek and Lewis Ranch, which feature high end townhomes, duplexes and single family homes which are adjacent to the slopes or ski in/ski out, providing the ultimate combination of location and comfort. In addition to endless options for winter fun, Copper Mountain offers summer activities as well. In the summer there is hiking, climbing, mountain biking, and golfing. Copper Mountain Resort is becoming a year round destination, known for its many winter and summer festivals. Owning Copper Mountain Real Estate could be the perfect fit for you and your family.